We've always said that playing co-op games online is a much different social experience, compared to typical multiplayer versus play. Just hop into any versus game of Halo 3 and compare the chatter to that of a co-op game of Halo 3. It's absolute night and day. Perhaps the reason is John Gabriel's Internet Fuckwad Theory, or perhaps it's has to do with aggressive behavior trigger by the game type. The latter theory was studied at the University of Missouri and its findings published in Evolution and Human Behavior, a popular science journal. 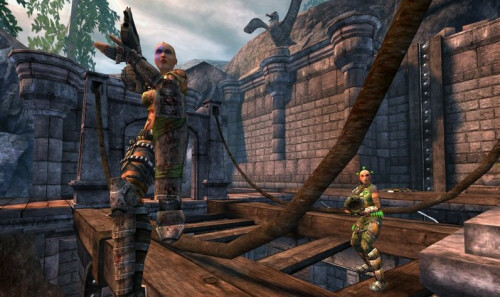 To create this test they set up groups of players that would compete in co-op/team oriented gametypes and deathmatch gametypes both with/against friends and strangers in Unreal Tournament 2004. The result? The players' testosterone response varied depending on whether they played "ingroup" or "outgroup" games, and was actually lower or "muted" during the former. In other words: Players were more aggressive toward players they didn't know than players they did. The summary that was printed doesn't quite support what we've seen, then again, they never really tested TRUE co-op play. We suggest that violent video games appeal to young men because the games tap their evolved motivation to engage in male–male competition and engage the same systems that evolved to allow them to engage in military and political strategizing. The corresponding hypothesis — men will show the testosterone winner effect found with meaningful male–male competition — was partially supported for the between-group tournaments. Still the end result at its core is the same - players that work together towards a common goal are less likely to be total douches and act out aggressively, then those that are competing for the biggest e-peen. Thanks Mrxknown_JG for the tip. Page created in 0.6205 seconds.